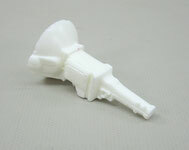 Here I will be listing 1/18 scale parts from cars like Ertl American Muscle, Highway 61, Sun Star, Yat Ming, GMP and other. These can be from damaged cars, Cars I robbed parts from, after market parts made by other companies or resin cast parts that I do myself. Click on the "Wheel Guide" to see a few hundred photos of 1/18 tires and wheels with detail info and sizes. 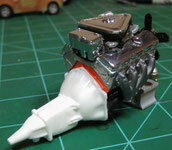 I'm also working on an "Engine Guide" see link below. 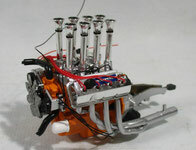 The "Model Car Magazine Forum" link below is a great place to hang out and get model building tips. Please note we are no longer shipping 1/18 model cars or parts outside the contiguous United States. This is the correct rear bumper, splash pan and exhaust tips for the GMP 1972 red GTO Stk# 8043. Includes instructions New in package. GMP. 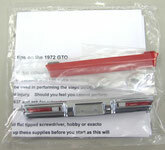 This is the Top Up for GTO Convertible. New in package. Ertl 1969 Camaro Front Endura Bumper in Cortez Silver. This is the correct replacement bumper for the chrome one that came on the car in error. PYE 1969 Camaro Cortez Silver from 1998. 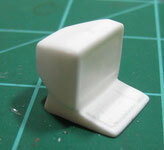 1/18 scale Realistic Hood Hinges. 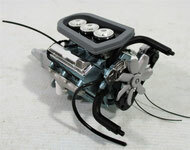 These are taken off a Highway 61 1970 Mustang but can be used on other cars to add detailing. As Shown. 2 hinges, One Left and One Right. Resin computer for you diorama office. 1/18 scale = 12 in monitor 1/25 scale = 16 in monitor Screen measures about .650 As Shown. 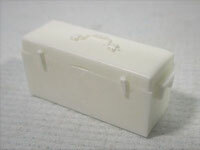 Resin tool box for your trunk or diorama. 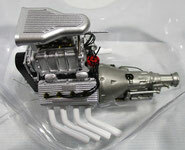 1/18 scale = 18 in 1/25 scale = 25 in Unpainted as Shown. 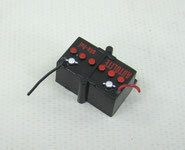 Resin tool box for your trunk or diorama. 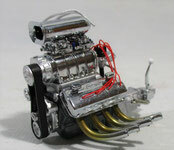 1/18 scale = 25 - 7/8 in 1/25 scale = 36 in Unpainted as Shown. 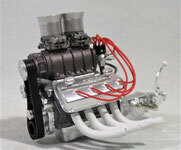 GMP / Acme Stk# 1800909 1/18 scale Chevy supercharged small block engine from 41 Willys, Thompson & Poole. 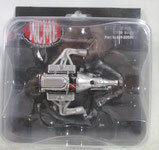 Automatic transmission New in Package. Parts that have been asked for. Here I will post the amount so you can purchase them through the check out process. Thank You.